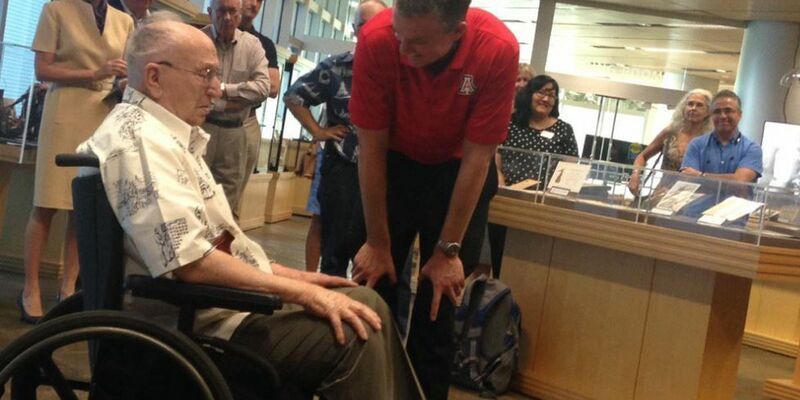 TUCSON, AZ (Tucson News Now) - Lauren Bruner, a WWII veteran, has returned to the University of Arizona ahead of the school's plans for commemorating 75 years since the attack on Pearl Harbor. Bruner was one of a couple hundred servicemen who managed to escape the sinking USS Arizona after it was hit on December 7, 1941. Today he is one of only six surviving members. Thursday night he received a personal briefing on the plans for a USS Arizona memorial on the campus mall. "It's like coming home again," he said. "I get a lot of satisfaction out of seeing everybody." Bruner said he hopes that the memorial will serve as a teaching tool for students and future generations to understand the impact that such a historic event had on their lives long before they were born. "They've got to be able to know their ancestors were involved," he said. "And they should be proud of them." memorial plaza in the center of the ship's outline, outside the open canyon walkway of the Student Union Memorial Center, according to a release from the university. It will help students and visitors alike to grasp the sheer size of the battleship, which was nearly 600 feet long and almost 100 feet wide. "We have experienced so many incredible moments in planning for this memorial, including the fact that the full-scale outline fits perfectly in that space south of the Student Union," said Chuck Albanese, retired dean and professor of the UA College of Architecture, Planning and Landscape Architecture, who has been involved in historic preservation in Tucson for decades. Bill Westcott, who's uncle - and namesake - died aboard the USS Arizona, has been working with Albanese in an effort to gain public support for this memorial. It has the approval of administrators but the project's been funded entirely through private donations. Westcott said people will think of the university and of Tucson when they remember the USS Arizona because of this memorial. And by doing so, they'll keep alive the stories of the men who served on the battleship. "These are the guys that made the world possible for the current 17-22 year old people," said Westcott. "We realize that if we don't tell that story and we don't do everything we can to keep it alive that it's going to disappear into the dust bin just like every other historic moment." The UA is a repository for artifacts from the USS Arizona with University Libraries' Special Collections managing one of the largest archives of memorabilia in the world from the ship, according to a release from the university. Westcott said he's hopeful that people will consider donating their USS Arizona and Pearl Harbor artifacts to the university instead of leaving them in storage to be forgotten. The memorial is expected to be complete in time for a dedication during a Remembrance Ceremony on Dec. 4 at 3 p.m. on the south side of the Student Union Memorial Center. Fundraising continues for the memorial, and donations can be made online: http://bit.ly/1EP2toH.